There's an insider's trick to shooting clay targets that can make the sport easier than you think. It involves your ability to tell time on a clock face (not a digital clock). 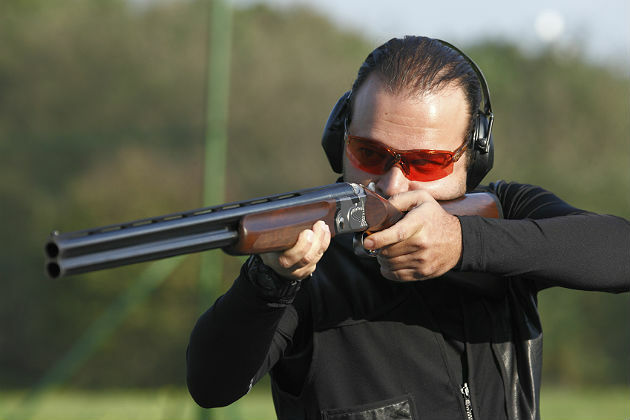 Any clays-shooting instructor will tell you that the most important aspect of the sport is focusing on the target. Without 100 percent target focus, your eyes will likely jump back to the barrel of the gun and during that momentary lapse the target is racing away and you're playing catch-up — increasing your chances of a miss. So when the instructor insists that you focus on the target, most shooters will concentrate on the whole target. The real trick is to focus on the leading edge of the target — or as some instructors call it "focusing small." The leading edge is the portion on the front of the target that, depending on the angle of the trajectory, you really want to hit. By hit, what we actually mean is that you want to place the shot string far enough in front of the flying target so that its leading edge will intersect with the stream of shot coming from the shell. Once that happens successfully, the target will be destroyed. The best way to "focus small" is by dissecting the target into time as shown on a clock face. 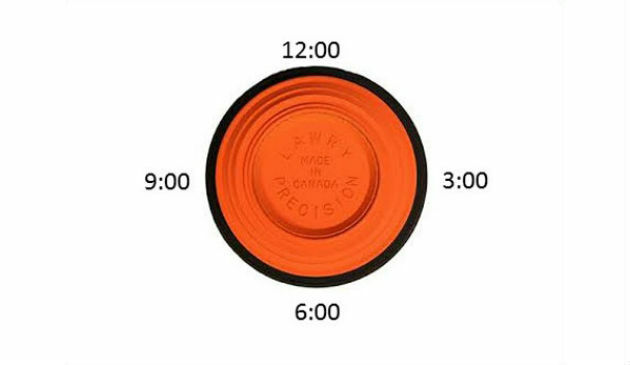 If you hold a clay target upright in front of you, the top of it is 12:00, the bottom is 6:00 and from there you can assign 3:00, 9:00 and any time in between. Start your target-clock drill with some simple presentations. On a high, slow incoming target you want to hit it at the peak of its travel line or 12:00. On a straight-away outgoing target, look at 6:00. Once you've mastered these easy targets, you can practice with more difficult presentations. On a left-to-right, quartering-away target with a 45-degree angle, you'll want to focus on approximately 2:00. If the target is left-to-right full crosser at a 90-degree angle from you, 3:00 might prove best. Let's say you have a right-to-left crossing target, your time will be 9:00. This clock-face technique applies to even the most challenging targets. One of the trickiest targets is a dropper coming from a high tower behind you. Even though these targets travel a considerable distance, when it suddenly appears overhead, the decline is fast and steep. You'll probably want to shoot under it at 12:00, which would be the leading edge. Chandelles are another dropping target that challenges shooters. And this where the clock-face technique really pays off. Chandelles are high-arcing targets. If you don't shoot the target at the apex or on the way up, you're faced with a plunging target that is completing its loop — meaning that you have to find the break point both in the fall and the ever-widening arc. Focusing 100 percent on right-to-left the chandelle, at its apex, you'll want to break it at either 12:00 or 1:00 at its highest point. If it's a left-to-right, you'll take the shot at either 12:00 or 11:00 at the apex. These points on the clock are estimates, since the targets always vary depending on speed, wind and angles. Shooting the chandelle as it still rises means that you're probably going to shoot it at 1:00 or 2:00 on a left-to-right or for right-to-left, your shot will be taken at 10:00 or 11:00. Sometimes you have to get the chandelle as it drops. A big mistake most sporting clays shooters make is to chase the target down in a looping swing. A better way is to swing the shotgun is straight across parallel to the ground (the shortest possible distance to the break point) and intercept it at approximately 8:00 in right-to-left or 5:00 in left-to-right. Never take your eyes off the target. Rolling rabbit targets often confound shooters. These targets seem to move faster than flying targets because of their proximity to the ground. In fact, most people miss rabbit targets in front. As the target continues through the puff of dirt from the missed shot, it tricks you into thinking that you shot behind it. For the most part, you want to focus on either 5:00 or 7:00 depending on whether the target is coming toward you going or away from you. Finding your time on the target is nearly foolproof because the method applies all of your visual concentration on the smallest point of the target you absolutely must hit in order to score a break. Commit to the time and go for it.